This is my first time to join Yummy Sunday so this will be my very first entry. Thanking my sister in law of Perfectly Blended for inviting me. My daughter, Chloe, had their fun day at school last year and one of their activities was making pizza. It was sponsored by Pizza Hut. After she put on the ketchup, ham and cheese, Pizza Hut crew took her finished product and sent it to their store for final 'cooking'. They returned it to her later and what you see in the picture was the result. Despite that, the pizza still taste good. Of course, Chloe was able to consume all her share! Though it looks like it's a little burnt, I still think it's yummy. Why? If it's a little over cooked, it'll be a little crispy, right?! Yummy. I think making pizza at school is a fun activity. Cool. Hmmmm, yummy talaga ang pizza. sis,I want to invite you too to join us every Friday naman if you can. nganong nasunog mana Mommy Cookie? ?kasayang gud..but atleast it tasted good diba..miss you.. 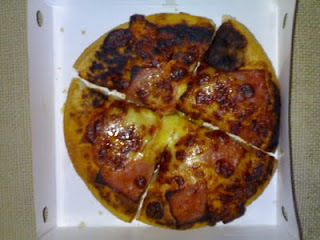 Although it's burnt but still look yummy to me.